For The Very First Time…..
….we made a trip with the kids to a …hold your breath…mall. We were skeptical and undecided, then finally, we gave in. It was just a matter of an hour or so. We thought about it and discussed at length. No, don’t get us wrong. The BF and I have a LOT of things to talk about, but taking the kids to a mall is a decision we’ve been putting off since the time they were born. Strolling through one is not really our idea of a good time, but the BF had visited one mall where he saw kids enjoying a few rides in the play area and immediately thought that our kids would love it too. Anyhow, so it being a Sunday, we expected the place to be crowded. We took a quick stroll, looking for the play-area. Instead, we found an adorable toy-train which would take the kids around the floor. The per head cost of ticket was 100/- which gave me a cardiac. But since the train was super cute and the twins were super excited, I gave in. Luckily, it wasn’t over-flowing, and we made our way around the floor. The BF didn’t join us, for obvious reasons 😀 . Once the train ride was over (too quickly, if you ask me 😐 ), we went over to the play-area. The rides which would cost 10/- anywhere else in the city, were billed at 40/- each. The worst part was that we just couldn’t pick any ride and be done with it! We had to purchase a card worth 220/- and then we could use any ride we wanted. This kind of flummoxed us and I was about to back out. My middle-class sensibilities reacted violently at this blatant loot. But the kids were already clambering into the toy helicopters and the BF just didn’t have the heart to ask them to come out. So we bought the cards and took the kids through the various rides. “Mumma, kitna mazza aa raha hai”, squealed Lui, as the toy boat swung up and down. Well, the happiness on the twin’s faces were worth every penny spent, I must say. Once the rides were over, we went over to the food court. Now, this was a bad decision on all counts. For two adults and two toddlers, we shelled out nearly 1000/- . The fact that the food wasn’t worth the price grated on us. The only reason we ate there was because the kids were tired and hungry and it would have taken us time to go out somewhere else. Overall, it was a fun evening, but not something we would be doing again. On their part, the kids totally erased the memory of the mall-trip the minute we reached home. They haven’t mentioned it or the rides since last week. It almost as if they never went there 😐 (we took them there last to last Sunday), which works just fine for us. Probably, the kids didn’t enjoy it as much to demand a second trip! Sometimes, I feel that the kids are changing and evolving rapidly, throwing away old habits and learning new ones. We talk to the twins about how they used to crawl as babies, the way they used to drool, the way they used to clap their hands. The twins, needless to say, find these tales highly amusing, as if tickled at the thought that they ever behaved like that! There was a picture on Facebook once, of two little babies, premies, snuggling inside the same incubator. Apparently, being premature babies, they were extremely fragile and were kept in two separate incubators. One of the kids’ health kept deteriorating, until one nurse thought of keeping them both in the same incubator. 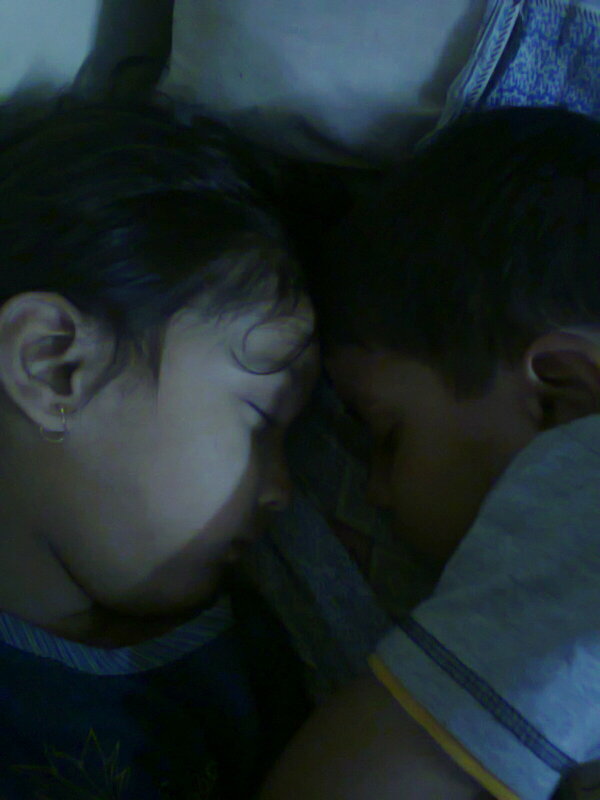 My twins, needless to say, seek each other’s company when in slumber, because since the time their hearts beat together, they’ve found company in each other. May Allah bless this beautiful bond that is so beyond our understanding. 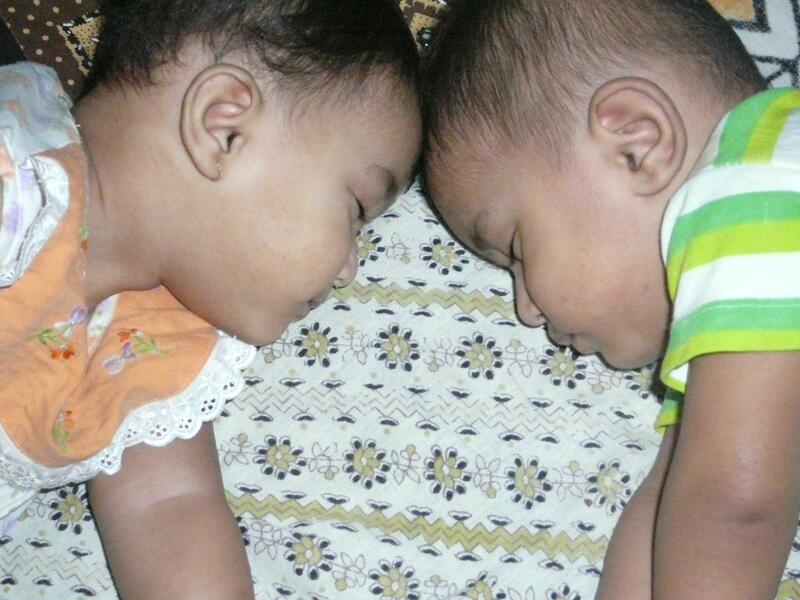 I’m sure all twins/triplets/and other ‘Lets’ must be sharing similar experiences with their siblings. I can only see it from a distance and rejoice, but they are lucky enough to experience it. May this bonding never change. Ameen. The book has a lot going for it, but the simmering undertones of resentment towards the British was what caught my attention the most. A pity that this particular angle wasn’t explored much. The story is about Barnabas C. Mehta, named thus because his father was always ready with the necessary ‘bandobast’ for his white master. The white master, Curtis, treats Barnabas like his own son, the one who will inherit Curtis’ vast knowledge and his love for the spirits! It is Curtis who encourages Barnabas to pursue his deduction skills and also prints formal visiting cards for Barnabas, if only to open the doors for the son of a servant cook, which otherwise would have been impossible in a British dominated Mumbai. Barnabas takes up the investigation of the missing wife of a wealthy dockyard owner, Stanton. What initially appeared like a well-planned escape plan by the wife, takes a more gruesome turn when dead bodies turn up unexpectedly. The investigating office declares it an open and shut case, but Barnabas believes otherwise. Following his instincts and clues gleaned through painstaking ways, he leads the case to ‘closure’. Most of the book, as expected, is dedicated to Barnabas’ efforts in piecing the clues together. There is a simplicity in his approach which is in sync with his surroundings. His dilemma regarding the British is also understandable. Like he says, who in living memory remembers how it feels to be truly ‘independent’? Would Indians be able to manage on their own, when neither the current generation nor their ancestors had any experience in running a country? These questions reflect the conflicts that I’m sure many youth in those days must have faced. The characters are well etched, except maybe the detective’s father, whose loyalty to Curtis clashes with his loyalty to the nation. I wish we had a clearer view of what Chetan (the father) truly felt about his years of service and the life that Barnanas led, thanks to Curtis. Being a die-hard Agatha Christie fan, I kept a sharp lookout for red-herrings, which the Dame was famous for. Surprisingly, there weren’t any. I don’t mean to say that the story was predictable, but the fact is, halfway through the book, I knew who had done it. I even deduced why it was done. The only thing that kept me glued was the ‘how’!! And it was rather gripping to read through it. What truly made the book stand out was the innate Indian-ness of the detective and the blockers in his search for truth. That he meekly gives in to silence when he would in fact like to rip the other person apart, speaks volumes of the subjugation of Indians, in their own land. “Barnabas” is a very well-written book. Like I mentioned before, it is a simple book, barely giving in to anything fancy. Read it while going on a trip or during a meal break. It will keep you adequately occupied. You won’t be disappointed. Truthfully speaking, I started reading her blog only after I entered her contest . But more than winning the book, I think my real reward was her blog itself. It was so full of daily humour, like the kinds found in Erma Bombeck books (another favourite) that I became an instant addict ! But coming to the good part, the book ROCKS!! Firstly, I had a terrible time getting through the book. No, no, don’t take me wrong. Its all the book’s fault!! Its not that I have a terrible reading speed, but seriously, if I have a twin soul somewhere out there, then it must be Yash. Clearly, the book is written from the heart. The beauty of its content lies in its simplicity, in its recollection of everyday instances, in its honesty about the little idiosyncrasies we all have. So the way Vijay confuses ‘contraction’ with ‘contraption’ when pacing nervously at his wife’s labor is something that even the BF does. Not pace, bungle up words when hyper 🙂 . The day-to-day life of a newly married couple is so charmingly captured, I doubt anyone would shake their head in wonder. Its all so believable because we’ve been there! The birth of Baby Peanut and the resulting mood swings, incompetent handling of a newborn, the worries about career and home, are all very well captured. They are as relate-able as looking at a mirror of our own lives. Here’s a BIG thumbs up to Yash. For a debut, she makes a rather solid start! It was bedtime and the twins were busy guzzling down their milk. I still hadn’t changed to home clothes (since I’d returned late from work) and was in my day’s office wear. The twins finished their milk and sported big, white milk mustaches. Lui grinned at me and leaned forward . I was sure this girl was going to wipe her mouth on my dress. I snapped at her to use a napkin. She leaped back, stung. Giving me the saddest look I’ve ever seen in her eyes, she said,”Mai to sirf pappi de rahi thi”. Yes, I felt smaller than a beetle. But last night, I felt awful. Though I pulled up my daughter and hugged her for all I was worth, I realized that a precious moment was lost. For what? A dress that could be easily washed the next day?! Another lesson learned. A Child’s love is precious. Respect it! I saw the movie “OMG: Oh My God” this weekend. It was a rather enjoyable watch as it made a strong case against unnecessary rituals and customs but not faith. Faith is unique, it is personal and it is within us. Hunting for it outside is a lack of conviction in the faith itself. The arguments in favor of blind faith were very powerful and I’m really hoping that people watch this movie with an open mind. Watch it and understand that God does not need our delicacies and fruits and jewellery. People who offer all these to idols of God, are doing what exactly?? I cringe each time I see milk being poured over idols 😦 . I’m sure many people who have seen the film would question the validity of their rituals. One friend at work had once narrated an incident where a ‘pujari’ refused to perform certain rituals for the friend’s house-warming ceremony. His words were, “There is no need. The process of following certain age-old rituals is equivalent to carrying the corpse of your ancestors. It serves no purpose but weighs you down unnecessarily”. We were mighty impressed by this, mainly because it came from a priest, people who are themselves sticklers for rituals ! The bone of contention that I had to pick, was that like every other Hindi movie, this one too was highly inaccurate about the Muslim way of belief. As always, I shook my head in dismay at the wrongful depiction of Islam and its rituals. How difficult is it really, to get hold of a regular muslim and just ‘ask’ him about the religion? I think the earliest perpetrator of fueling misconceptions was that sorry tale of a romance, wedding and divorce, called “Nikaah”. For years I’ve been fending off remarks on how muslims either live in mansions or in shanties. Sorry, but there is a HUGE population which lives in between the two levels. For years I wasted efforts in telling friends that saying “Talak, Talak, Talak” three times in a row does not qualify a divorce. The method of claiming Talak (according to Quran) takes months!! Each utterance of ‘talak’ should be separated by a period of one month, during which the families have to try and reconcile the two parties. The ‘talak’ should be uttered in the presence of witnesses and religious priests. Also, if the priests or family elders believe that the warring couples can be reconciled, given time, then a divorce proceeding may be extended by a few more months. Lastly, the most important part, women have an equal authority to demand a talak, only that, in their case, the word is ‘Khulla’. Irrespective of who asks for the divorce first, the woman is entitled to alimony/maintenance and Mehr (if she has children) or just mehr (if she doesn’t have kids). There were plenty of ignorant muslims who used the movie as an example to obtain a quick divorce. There were variations, wherein coward men sent across their intentions via the phone/internet. The worst part was that many other ignoramuses fell for the ruse and didn’t bother to check if the other party was following the correct Islamic practice. But it isn’t just about “Nikaah”. Even new-age movies like “Dilli-6” go wrong. In one of the songs, Abhishek Bachchan is shown kneeling down for a Sajda. Shooting in the Jama Masjid, how long does it take to observe the hundreds of muslims praying there to check for the correct posture, method? So Abhishek bows down and touches his forehead to the ground, where everyone else around him touches the nose along with the forehead, which is the correct method. It might seem like a trivial matter, but really, it peeves me to no end!! And No, we do NOT pray with the Quran in front of us. Karan Johar, you got it all wrong in KKHH ! Coming back to OMG, I couldn’t help but agree with movie “OMG”, mostly because this is exactly what Islam preaches – do away with irrelevant rituals, customs. Allah just needs your love and faith. As long as we have the love of Allah in our hearts, we don’t need to do anything else. What is namaz, if not the interaction between us and the Lord above?? You directly pray to him, without the constraints of a third party, without the barriers of barricades without the worries of monetary payments! The only reason muslim men go to the Masjid (a simple room with bare walls) for prayers is because the Quran directs men to pray as a group, though each one’s prayer is his own. When Paresh Rawal’s character questions the beliefs of the religious heads, regarding Islam, he questions the faith of ‘chadar chadhana’ at dargahs. Well, you know what?? A LOT of muslims worry about the ‘chadar chadhana’ ritual ourselves! It amuses us to see people of other faiths coming to the dargah to ask for the pir/baba’s blessings, whereas us muslims go to the dargah to pray for the pir/baba! To beg Allah to shower all his mercies and benevolence on the person who came this far east to spread the message of Islam. To thank Allah for sending the messenger our way (A lot of my friends believe that Islam was brought to India by the Mughals, which is equal to believing that Chinese food was brought to India by Chinese, when in actual, it was brought to India by Tibetans and Nepalis. There is a difference there. I hope my analogy makes sense 😐 . Mughals were responsible for very few conversions. Its is people like Khwaja Nizamuddin Aulia, Delhi, and Khwaja Gareeb Nawaz, Ajmer who had better success in preaching about Islam. The earliest converts were people from lower strata of the society, who were tempted at the security of equality and brotherhood as a way of life). We don’t ask the pir/baba to help us. He cannot, since he was a mortal human himself. The only one who may fulfill our wishes/prayers is the one God above. The other kind of muslim stereotyping is with the clothes we wear. For years, movies showed muslim women wearing shararas(one piece lehenga) and ghararas(divided lehenga) at home!! Get real people!! Muslim women wear shalwar-kameez or Saris at home. Even the rich ones! And no, pathanis are not the sworn dress code for men. Sure it looks good, but most muslim men would wear a pathani only on a Friday for the afternoon prayers (which are similar to Christian’s Sunday mass – prayers followed by sermon). The rest of the time, they wear regular clothes, you know, the trousers and denim kind. Surma is mostly used on special occasions, like Eid, except for women, who may apply it whenever (like me, who uses is every single day!). There are a few exceptions though, like the movie Aamir, where the lead was from a regular muslim family, whose sister and brother wore regular college attire – jeans and t-shirts and whose mother was in sari. They didn’t need to display superficial visual aids which screamed out “MUSLIMS”. There!! I went on a tangent again. So I better stop now. Else there will be no end to this post. Once again, this post isn’t meant to offend anyone, but in case some statements have inadvertently done so, then I forward my humble apologies. Yes, this is exactly what I noticed after visiting the twin’s school for the parent-teachers meetings. There were deep furrows on the brow and not so pretty trenches from nose to chin. Anyhow, had a meeting at the twin’s school today. There wasn’t much to do as I reached 5 minutes late and the speeches had begun. Got a seat in the last row from where I couldn’t see anything up ahead. The speeches went on and on and on. I think I zoned out after a while. There were some small performances from a group of kids, which just made me realize that my kids weren’t selected for any of the performances (the school had given an off to all other students). Oh well! Lui-Shobs weren’t meant for the stage, I guess. Must have inherited that gene from their father. After nearly an hour and a half, I got my chance to meet up with the class teachers (yep, there were two of them). When I said, I’m Lui and Shobs mother, the first teacher gave a big grin, shook her head from left to right, probably remembering something severely naughty about the twins and just told me that the kids were doing fine. The second teacher was a lot more direct. When I told her I was Lui and Shobs mother, she gave a big grin, shook her head from left to right and Wait! Thats all the similarity between the two teachers! After the secret smile, she proceeded to dump a list of issues about the twins. “Lui is too talkative” (yeah! Tell me about it 🙄 ), “She disrupts the class with her tales” (YAAAWWWNN), “Poor writing skills” (MUST ask Lui to start writing her own blog) . Overall, there was no need for me to break out in cold sweat as I awaited my turn. But still… PTA??!! Not enjoyable. The only concern from my side is that Lui writes mirror images. Her ‘5’, ‘2’, ‘7’, ‘B’ ,etc are all written in opposite direction. It could just be a temporary thing or it could be indication of something more serious. Anyone encountered this problem before? Any suggestions?? Is this worth worrying about?? Any input will be most appreciated. P.S : Any suggestions/home remedies for those damn wrinkles would be appreciated too.